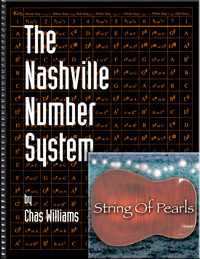 The Nashville Number System (7th Edition) comes with a copy of Chas Williams' latest cd, "String of Pearls". BUY IT NOW! Also Available as a downloadable version for computer or iPad! In the late 50's, Neil Matthews devised a musical number system for the Jordanaires to use in the studio. Charlie McCoy and fellow studio musicians began adapting Matthews' number system into chord charts. The Nashville Number System has evolved into a complete method of writing chord charts and melodies---combining Nashville shorthand with formal notation standards. 7th EDTION NOW AVAILABLE AT A GREAT PRICE! Custom charts of your song written by Chas. If you're not sure how to write a number chart for your song, or if you have questions about the Number System for more information. The Nashville Number System is a required test at Belmont University, Vanderbilt's Blair School of Music, MTSU, Capital University and Liberty University. It is also used as a text at Berklee College of Music and Mediatech Institute in Austin. View an INTERACTIVE SONG CHART from String of Pearls!